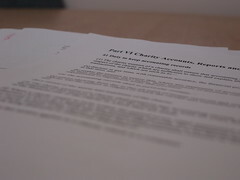 I have just completed another letter to the Inland Revenue with regard to my 06-07 tax returns. All my income is taxed at source and so it was with some surprise that I received a tax bill for another £1500. Months later it has risen to £2200 as the amendments have not worked. After many phonecalls (the people are very polite) and letters I am hoping that this latest amendment resolves the problem. It appears that the source of my problems is moving jobs part way through a tax year and being declassified from a “minister of religion” to a standard tax payer. Let’s hope this is the end of the problems! !